HONG KONG—The battle for the important second place position of the Rugby Premiership that will allow a bye through to the semi-final of the Grand Championship, will go head to head between Natixis HKFC and Leighton Asia HKCC this Saturday Feb 20,2016 at Sports Road, in the last round of the regular season. With 4 points now separating the teams (HKCC 41, HKFC 37) the odds are still on Cricket Club, as all they need is a win or narrow defeat (within 7 points) to stay ahead. HKFC however need a bonus point win to put them safe and although their performance has improved dramatically since the turn of the year, they may have a more difficult task against the HKCC squad, who beat HKFC 32-12 at their last meeting at Sports Road on Jan 9. 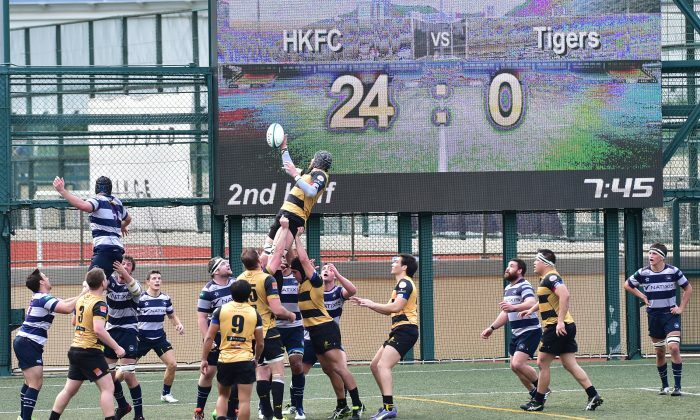 In last week’s match at HKFC on Saturday Feb 13 HKFC breezed to victory over Tigers winning 57-7 and picking up an important bonus point in the Premiership standings. Seemingly taking a page from the Natixis Cup the week before, they played fast moving, running rugby that Tigers found hard to contain. Tigers were well in contention for the first quarter of the match keeping HKFC (Club) mainly pinned in their own half. It was not until the 14th minute that Club made steady progress up-field and after a succession of attempts prop Ronan Donnelly dived through to score, Jamie Hood converted for 7-0. Club scored their second through a final 10 metre run by Jamie McGregor to score on 22 minutes, the conversion was missed making the score 12-0. Donnelly with strong support by McGregor scored again after good forward move by Pierce Mackinlay-West. Hood converted to stretch the lead to 19-0 after 32 minutes of play. After good work by Jamie McGregor, Harry Struss (No 5) went over to score with just a minute left of the first half making 24-0 at half time. Tigers put Club under pressure early in the second half and after successive lineouts, pushed forward with a driving maul for Henjo van Niekerk to score; converted by Liam Gallaher (24-7). Straight from the restart Jamie Lauder just missed scoring under the Tiger’s posts but was stopped by fly-half Wharenui Hawera. After a couple of 5 metre scums Josh Afu went over to score for Club on 52 minutes (29-7). Club were back at the Tigers 5 metre line 5 minutes later with successive, strong forwards play but Hood passed the ball out to the wing on the blind side for Jonny Rees to score.(36-7). It was now all Club, with replacement Cameron Smith sprinting from the half way line to score, (43-7), a surging run by Ben Axten-Burrett and a kick forward for Hood to collect to score and convert at the posts, (50-7) with 5 minutes left on the clock. Some further good work by Club forwards lead to a one-on-one successful push by Daniel Favey against Sam Purvis, and a good conversion this time by Niall Rowark took the score to 57-7. In the other matches Society Generale Valley put in another strong performance to beat Bloomberg HK Scottish 41-10 and Leighton Asia HKCC just pipped Sabre Kowloon 20-19.